Being single can be kinda sad. So why not cheer yourself up with some shopping? That’s what a few lonely Chinese university students thought in the 1990s. They wanted to celebrate their single status by treating themselves, and since “11/11” looks like four lonely men standing next to each other, they held their little shopping spree on November 11th. From those humble beginnings, the world’s largest shopping event was born, dwarfing Black Friday and Cyber Monday. The students may have started it, but the day didn’t really take off until Alibaba got involved. In 2003, Alibaba took Singles’ Day to the next level by branding it as an annual shopping festival, providing steep discounts on both of its ecommerce platforms: Taobao and Tmall (named as Taobao Mall back then). More and more customers and retailers joined in, turning it into a day marked around the country. 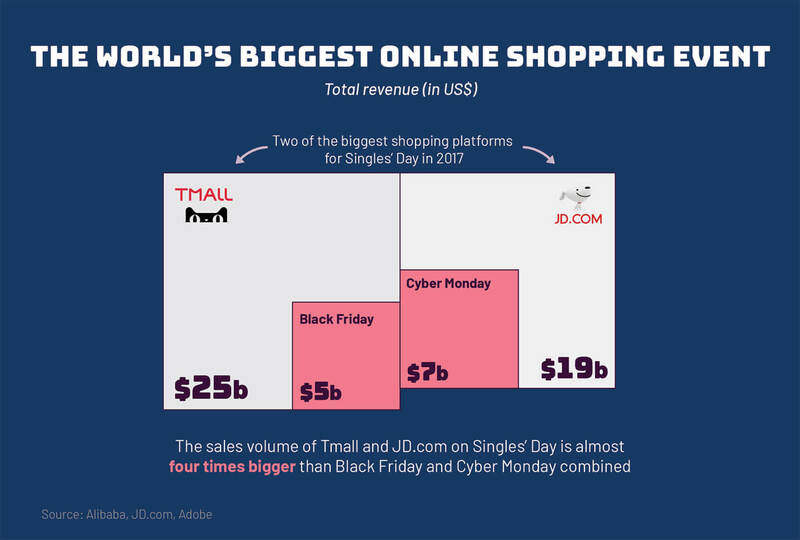 And the numbers are staggering: The total sales of Tmall and JD.com on 2017’s Singles’ Day was almost four times bigger than same year’s Black Friday and Cyber Monday combined. And those are just two shopping platforms! The shopping may be digital, but the resulting products are physical -- and the sheer number of products bought meant a logistical nightmare for postal services. 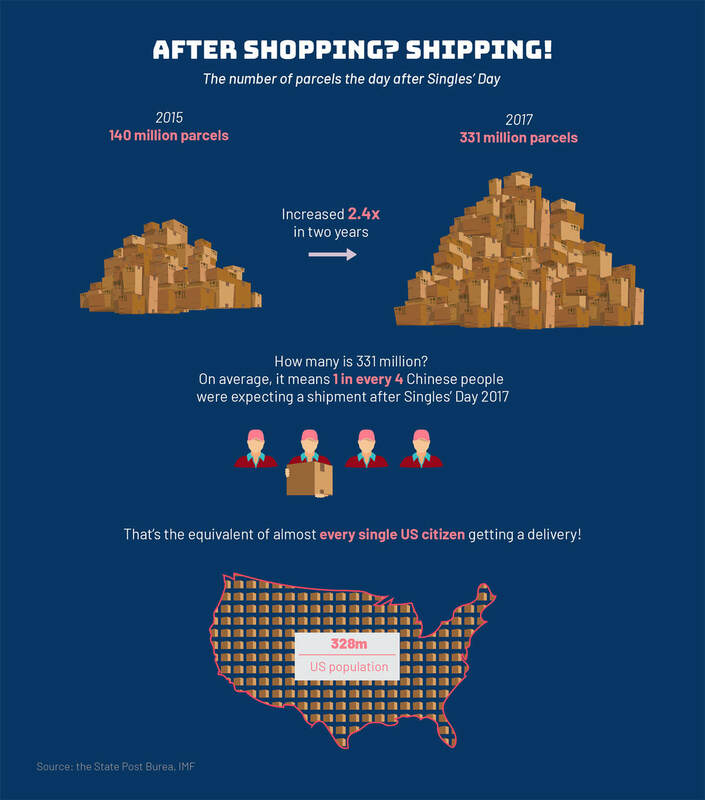 In 2012, 78 million parcels flooded the system after Singles’ Day. The shipping broke down under the strain, and it took some customers months to get what they bought. Just a few years later, things have gotten a lot better… and a lot bigger. The next year, 140 million parcels were handled on the day after Singles’ Day. By 2017, that number jumped: 331 million parcels were handled on November 12, according to postal authorities. Even though the day is widely known as Singles’ Day, many retailers have an alternate name for it. That’s because, two weeks ahead of 2014’s Singles’ Day, Alibaba suddenly announced that they registered a trademark for the most commonly used Chinese name -- “双十一” -- which translates as “double eleven” in English. Many other ecommerce sites, including Tmall’s major rival JD.com, complained about Alibaba’s move. But they ended up having no choice but to use digits -- “11.11” -- instead of the more common name. The trademark wasn’t the only time Alibaba and JD.com battled over Singles’ Day. 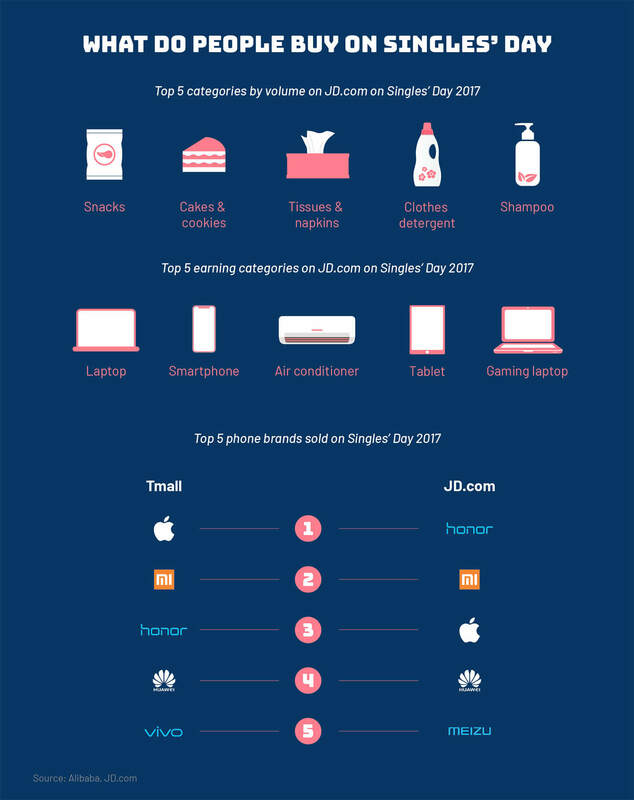 In 2015, JD.com blasted “certain competitors”, implying Tmall, for forcing merchants to “pick sides” during the Singles’ Day. Huxiu later confirmed that if a business wants to appear on Tmall’s main promotion page during the event, it has to either exit from JD.com or offer a lower price for customers on Tmall. To prevent similar unhealthy competition from happening this year, the State Administration for Market Regulation invited Alibaba, JD.com, Pinduoduo and many other ecommerce companies for “talks”, during which the shopping sites were warned about unfair agreements, exaggerated advertisements as well as fake products.